The Cement Division of Birla Corporation Limited has seven plants, two each at Satna (M.P.) - Satna Cement Works & Birla Vikas Cement, Chanderia (Rajasthan) - Birla Cement Works & Chanderia Cement Works, Durgapur (W.B.) - Durgapur Cement Works & Durga Hitech Cement - and one at Raebareli (U.P. )-Raebareli Cement Works. They manufacture varieties of cement like Ordinary Portland Cement (OPC), 43 & 53 grades, Portland Pozzolana Cement (PPC), Fly Ash - based PPC, Low Alkali Portland Cement, Portland Slag Cement, Low Heat Cement and Sulphate Resistant Cement. 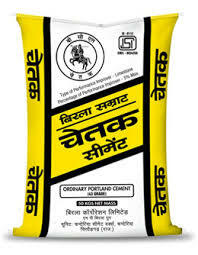 The cement is marketed under the brand names of Birla Cement SAMRAT, Birla Cement KHAJURAHO, Birla Cement CHETAK and Birla Premium Cement, bringing the product under the common brand of Birla Cement while retaining the niche identity of SAMRAT for blended cement, i.e. PPC & PSC, for all the units, KHAJURAHO (for the OPC product of Satna) and CHETAK (for the OPC product of Chanderia). The Division exports large quantities of cement to Nepal, under the brand names of Birla Cement Samrat, Birla Cement Khajuraho and Birla Cement. The special variety of Birla Cement SAMRAT, being produced by the company, is ideal for mass concrete, RCC/pre-stressed/precast structure (for reduced thermal crack), increased water tightness of concrete, increased resistance to sulphate soils and aggressive water and increased resistance to alkali aggregate reaction besides corrosion resistant properties. All our cement plants are ISO 9001:2000 Certificated, covering the entire range of production and marketing. SCW & BVC have received the IS/ISO 14001 certificate, an international recognition for "Implementation of Environmental Management System". (SCW has been awarded GREENTECH Safety Silver Award 2009 and GREENTECH Environment Excellence Award 2008 by GREENTECH Foundation, New Delhi. It has also received the First Prize for Maximum Reduction in KWH/ton of cement in M.P. from FLS Energy Award, Bhopal, in 2008. The Satna units received the Quality Circle Excellence Award from Quality Circle Forum of India, Durgapur Chapter; Quality Circle Excellence Award and Quality Circle Distinguish Award from Quality Circle Forum of India, Kanpur Chapter, both in 2008, and Quality Circle Forum of India, Baroda. SCW has received the National Award for Excellence in Water Management from CII, Hyderabad and First Prize for Lowest Thermal Energy Consumption K. Cal/kg clinker under the 10th FLS Energy Award 2007. BVC has received the National Award for Excellence in Water Management from CII, Hyderabad, National Award for Energy Efficiency in Indian Cement Industry from NCCBM, New Delhi and Lowest Electrical Energy Consumption K. cal/kg clinker under the 10th FLS Energy Award in 2007. NCBM has given BVC the "Second Best Improvement in Electrical Energy Performance" Award for 2006-07. SCW received the Best Energy Conservation Implementation Gold Award from Rajiv Gandhi Memorial National Award, Hyderabad, in 2004. BCW & CCW have received the IS/ISO : 14001 Certification for "Environmental Management System". BCW & CCW have bagged various awards from the NPC & NCCBM. CCW has won the "Lai Bahadur Shastri Memorial National" award for "Excellent Pollution Control Implementation" for 2001-02 by International Greenland Society. VEC, Chennai, chose the Chanderia units for s stained implementation of condition monitoring and continued Machine Health Improvement award during 2001-02. The "Workers Education Trophy" was awarded by the Central Board for Workers Education, Udaipur, Ministry of Labour, Government of India, for excellent contribution and implementation of workers training programmes during 1998-99 & again in 2001-02. The laboratories of BCW & CCW have been accredited by NABL (National Accreditation Board of Testing and Calibration Laboratories) as per ISO/IEC 17025. BCL has regularly been receiving CAPEXIL awards for cement exports since the last more than 15 years. Power Plants : The Cement Division has two high-ash coal-based captive power plants at Satna (27 MW) and Chanderia (29.8 MW) each. The power plant at Chanderia received the FIVE 'S' Workplace Management System Certification from QCFI, Secunderabad.